Ten months separate the writing of the two Maigret novels, Félicie est là (Maigret and the Toy Village) in May 1942 and L’Inspecteur Cadavre (Maigret’s Rival) in March 1943. Between these two novels, Simenon wrote the novel La Fenêtre des Rouet (Across the Street) and finished the third and final part of his longest novel Pedigree. The two Maigret novels are very different in tone, atmosphere and character. Located a few kilometres west of Paris, and although a murder has taken place, Maigret and the Toy Village is much lighter and fresher in tone, revolving mainly around the tussle of wills between the determined twenty-four year old Félicie and Maigret. The setting, in springtime, is on an estate in the process of being built, which will establish a community in the course of time. By contrast, Maigret’s Rival is darker, sinister and more complex, set in January in a village of the Vendée region of France with a well established and engrained rural way of life. During the Second World War, Simenon was living in various properties in the south west of France. In June 1940, France was partitioned into the Occupied Zone (the north, with an area down the west side of the country as far as Spain) and the Unoccupied Zone (the south, just north of Vichy to the Mediterranean). In October 1942 Simenon was hoping to move into the Free Zone, perhaps to go as far as the Island of Porquerolles off the coast of the Riviera, but the Zone was taken over by the Occupying forces and so he had to make other plans. 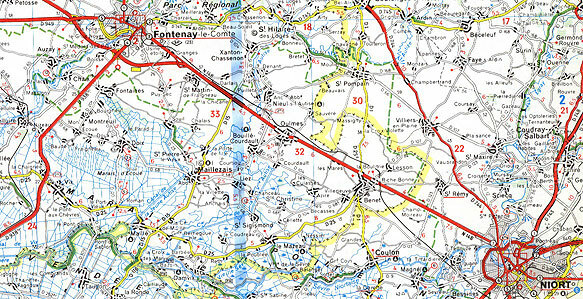 He, his wife Tigy, their young son and Boule moved the forty kilometres from Fontenay-le-Comte (Vendée) to a rented villa in the village of Saint-Mesmin-le-Vieux in the same département, about mid-way along the route between Pouzauge (Vendée) and Cerizay (Deux-Sèvres). The villa had a very large garden in which Simenon planted vegetables, even tobacco. There were fruit trees and space for a variety of livestock so that they could become self sufficient as they were to remain there until the end of the war. It was in Saint-Mesmin-le-Vieux that the author finished the novel Pedigree, then wrote Maigret’s Rival, as well as five other novels. During 1944, he contracted pleurisy and convalescing on the coast at Les Sables d’Olonne managed to write only four short stories early in 1945. 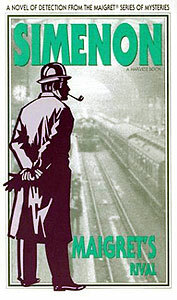 L’Inspecteur Cadavre (Maigret’s Rival) was the only Maigret work that he produced during this period. From the outset of this novel, Simenon, in his own succinct way, describes the atmosphere of the Vendée landscape in January, as Maigret travels by the local train to the village of Saint-Aubin-les-Marais. [Simenon has invented the location of this village exactly twenty-two kilometres from Fontenay-le-Comte (Vendée) in the direction of Niort (Deux-Sèvres). This places it between Benet (Vendée) and the border with the département of Deux-Sèvres, not far from the area know as the Marais Vendée]. A section of a map that shows the area between Niort and Fontenay-le-Comte. Simenon positions the village of Saint-Aubin-les-Marais between Benet (Vendée) and the border with the département of Deux-Sèvres. (Michelin Motoring Atlas: France, London, Paul Hamlyn, 1990). Earlier in Paris, Victor Bréjon, an Examining Magistrate, had requested Maigret to investigate, unofficially, the situation concerning Étienne Naud, Bréjon’s brother-in-law, who was living in Saint-Aubin-le-Marais. Recently in that area, the body of a local lad had been found on the railway line and all sorts of rumours were circulating in the village. Whilst on the train, Maigret recognises a fellow passenger, Justin Cavre, a former Inspector with the Police Judiciaire in Paris (who was nicknamed L’Inspecteur Cadavre), now a private investigator. Maigret is curious as to why Cavre has journeyed to the same village as himself, and for a while Maigret and Cavre seem to be playing a cat and mouse game as later they interview, independently, various people in the village. Maigret is met at the station by Étienne Naud who invites him to be a guest at his home, and almost at once Maigret senses the ponderous atmosphere that seems to envelope the household. This mood is not alleviated when he goes elsewhere to talk to other people. He soon discovers that there are certain factions within the community expressing views or hinting, some remaining silent, whilst others wanting the situation to fade from sight. With hostility towards him and being very much aware that he is acting in an unofficial capacity without his usual colleagues to assist him, Maigret wonders why he is there and considers seriously abandoning the enquiry and returning to Paris. The only person that shows an open interest is the lad Albert Fillon who was a friend of the victim. At least he is willing to help Maigret with his enquiries, so Maigret continues, discerning a situation involving deception and manipulation. The English translation was first published in hardback format by Hamish Hamilton in the UK in 1979 and by Harcourt Brace Jovanovich in the USA in1980 under the title of Maigret’s Rival. The translator is Helen Thomson who follows Simenon’s French text closely. Roddy (1/4/06) refers to the Penguin paperback edition that was published in 2003, but under the title of Inspector Cadaver. To commemorate the centenary of the birth of Georges Simenon in 2003, a number of reprints were published. Many of these had different overall titles and a new introduction. All the Penguin Maigret titles reissued during 2003 and 2004 have minor revisions to the translations. This is stated on the reverse of the title page, but no names are credited. The exception is with the translation of The Madman of Bergerac where the revisions are more extensive, and The Bar on the Seine, which receives a new translation. The minor revisions to the Penguin edition of Inspector Cadaver seems to consist of exchanging certain capital letters for lower case ones, unless I have missed some other changes.